Our work in connecting exchange students and families has been a tremendous success over the last 65 years. ATAD‘s experienced leadership in partnering with families and area schools has led to a rich network of school and family involvement. 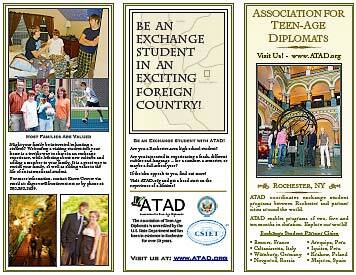 Hosting an ATAD student is a great opportunity to add dimension and understanding to your family. Hosting an ATAD student often feels like adopting a new member to your family. More than just being a tourist, exchange students often become deeply embedded and involved with their Rochester families. Hosting a student is a richly rewarding experience for everyone involved! We are happy to answer questions about our programs and our prospective students. Please contact us through our “Contact” page for information. A page containing brief profiles of our currently available students is linked here. How long do students stay in Rochester? Full year students arrive before the start of the school year, generally in late August. They stay through June. Semester students arrive in early January and stay through June. Summer students are here for 2 months. What types of families can host? What is required of host families? A Host Family provides a bed, study area, and three meals a day for the exchange student. The expectation is that the exchange student will be an integral part of the family. This means staying in a home to experience ordinary family life. The Host Family is not expected to give the student an allowance; the student provides his/her own spending money and health insurance. What is the financial cost of being a host family? Exchange students have their own spending money for shopping, social activities and school events. Host families are not supposed to be providing spending money or giving an allowance. Do we need to provide medical expense coverage? No, exchange students are covered by medical insurance provided through ATAD. How well do students speak English? To be eligible for participation in ATAD’s program, students need to have passed a test demonstrating proficiency in English. Their proficiency and confidence will also make rapid gains as they immerse themselves in life as a teenager in Rochester. How will the exchange experience benefit the Host Family and exchange student? Each will learn about another culture and language, while gaining a broader perspective of the world. You may also learn more about your own culture as you share with your student and/or family. The experience could develop into a life-long relationship. What are the age and language requirements for International Students visiting Rochester? The International Student must be between the ages of 15 1/2 and 18 1/2 at the time of departure to the United States. Applicants for the summer program may be as young as 14 at the time of departure. Students must demonstrate sufficient English proficiency to participate in the exchange program. Year and semester students must be able to handle reading and writing school assignments in English. What if a student placed with me had problems? A support person is assigned to each student and family and is in contact with you on a regular basis. If a problem arises, the ATAD support network is there to help resolve the situation. Interaction with your student’s ATAD Laison is important in sorting out any misunderstandings and conflict. ATAD advisers have a great deal of experience with past students. We also provide significant support and orientation training during the placement semester or year. Do I need to purchase special health insurance? For International students applying to go to the Rochester area: United States law requires a special type of insurance for exchange students coming to the US. The insurance must be purchased through ATAD, and meets all United States requirements. No. ATAD doesn’t allow this. Why does ATAD conduct criminal background checks? The safety and success of all of our students and families is our highest priority. Background checks are required by the State Department for host family members aged 18+, as well as our volunteers and board members. It’s a fun way to learn more about the world without leaving home! Children who have international siblings develop a better knowledge of the globe and understanding about the world! 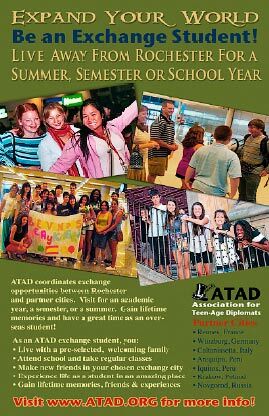 ATAD students are carefully matched with host families, and excellent support is provided for the International student, family and school by experienced Program Liaisons, all of whom are volunteers. Incoming students are highly motivated teens who are eager to learn about family life in the US. Having an International student in your home promotes understanding of other cultures through personal relationships. It is a great way to help foster the spirit of the “Sister Cities” program within our world. Having someone live in your home gives your child first-hand experience with what it is like to adjust to another culture. Maybe your child will want to visit as an exchange student in the future. Host families often learn a lot about our community, since they often visit museums, galleries, festivals, parades and other special events with their student. A terrific opportunity for learning about other parts of the world through the eyes of your visiting student! Getting to meet and develop friendships with other families who are hosting international students in the community. You are likely to have gained a lifetime family member by the end of your student’s visit! If you are a local secondary school teacher or administrator, please help us by completing the brief survey linked here. Click here to view a printable copy. "The ATAD program exceeded my expectations in organization and generosity...thank you ATAD, for my merit award and for the experience." "I feel very lucky because now I have two families, two (new) siblings, two dogs, two great schools, two homes, and hundreds of friends here and in the U.S. that I can trust." "I feel very lucky because now I have...two different lives, a little American accent, a piece of an American heart, a different view of the world and an experience I'll never be able to forget." Copyright 2002-2019, Association of Teen-Age Diplomats (ATAD) | All Rights Reserved | Website by Fusion Reactions.